The price was unbelievable. A Sig Sauer for $399? Something must be wrong with it. 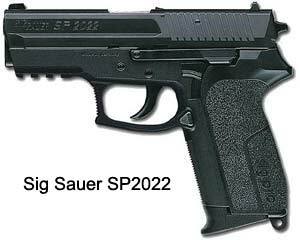 There were a few rumors on the net about a new Pistol, the SP250, coming out as a replacement for the SP2022. Wrong! They’re both stil in Sig’s lineup. Maybe it was a police buy that got caught up in politics. Who knows, but Cheaper Than Dirt had ten at this unbelievable price and they were sure to go fast. I didn’t need another pistol, especially not another 9mm, but what the heck. It was a Sig and I could always get my money back. When I got to looking closer, I discovered the gun had a few add-ons that would normally jack the price up. It has Tijicon night sights and a double action only (DAO) trigger. The gun feels good in the hand. It hold 15 + 1 and magazines are readily available. I bought one at the Fort Worth Gun Show and a couple more from CDNN Sports in Abilene. The gun came with two. There’s no question that it’s a Sig with the quality typical of the brand. At the range I found it frustrating at first. The trigger pull is just over 10 pounds and it’s a long pull. I found myself tiring while waiting for it happen. More than once I did the shooter’s equivalent of stepping out of the batter’s box on my first shot. After a while I got used to it and my shots didn’t suffer. 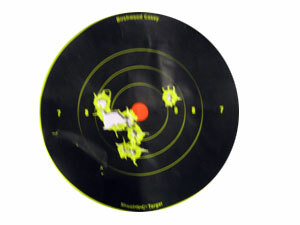 Here’s a target from my third or fourth trip to the range. This was shot at 15 yards. I made one adjustment to the gun that doesn’t seem to make much difference in either shootability or accuracy. I replaced the stock trigger with a short pull trigger, a $9.95 mod. This didn’t change the weight of the pull, but was supposed to shorten the length of pull. I honesty can’t feel any difference. The SP2022 spent a few months as my daily carry weapon. Although it has no external safety, the heavy double action trigger makes it a very safe IWB carry weapon. Had I needed the gun, the trigger pull would have been a non-issue. Now, it’s my upstairs household gun and with it’s Trijicon sights and excellent accuracy, it is comforting to have around. It’s now a year after I wrote the original blog entry and I still have an SP2022, but it’s not the original DAO pistol. I advertised the original one for sale on TexasGunTrader.com and it found a new home. A couple of months later Academy Sports put the Sig Sauer SP2022 on sale for $399 and this one was a DA/SA pistol. I bought one. It doesn’t have the night sights the original one had, but it sure shoots easier. I often take it to our CHL classes to let people who have not yet decided on the gun they want to carry shoot it for their proficiencey test. This one I’ll probablykeep. I’m now surrounded by Sigs. The second 9mm, the one written about in the April 2011 follow-up is one of the loaners we use at Texas Gun Pros for our License to Carry Class. After 5,000 to 6,000 rounds the slide got to where it wouldn’t lock back after the last round was fired, no matter what magazine was in it. A quick trip back to Sig with a very small repair charge and it’s back at work again. I got a replacement for the house, one with night sights and it’s now my wife’s upstairs comfort gun. She has an M&P 9mm by her side of the bed. One thing that continues to intrigue me about the SP2022 is the quality for the money. I have a couple of P226s and a couple of P229s that are $900 to $1200 pistols. The SP2022 is almost exactly the same size as the very popular PP229. The slide operation is easier, or seems so to me, and the slide lock is definitely easier to operate. There is not $500 difference in those guns. The SP2022 is one of the best values on the market for a good 9mm or .40 ACP handgun.